Horse racing is a hugely popular sport, with many people up and down the UK placing bets, visiting racecourses and watching on TV every single day. A day out at the races can be a very enjoyable experience, and even if you are not a horse racing expert, you can still have a great day and pick some winners. Whether you are going to visit a racecourse, or you just want to begin betting and watching from your own home, our beginners guide to horse race betting will help you understand what you need to know, and more importantly pick out some winners along the way. Horse racing can look confusing from the outside, but it is a hugely exciting and fun sport to be involved in, and once you know the basics you have more than enough to begin betting and enjoying yourself. Once you’ve got to grips with everything below, why don’t you check out what betting bonuses are available. How to bet on horses and win is something that many people want to know how to do. Even those new to the sport can have success at betting on horses, by just following a handful of simple rules. If you look at the factors below and use them to help choose your horses then you are in a great position and you should have some success. The first thing you should look at when looking at a horse race is recent form. Has your potential selection shown good form recently? Often horses will prefer to run at a certain time of the year, or they will need runs to get fit, so if you find a horse that is in good recent form you know that none of these will affect your selection. Being in good recent form does not mean that they have won recently, but they do need to have been involved in races and come close to winning. For example, if a horse has finished 3rd and 4th in recent runs then that can be classed as good recent form, even though the horse has not won. Not every race is won by the top jockeys and trainers, but if you are looking for hints and tips to get you started, then looking for the best jockeys and trainers is a good place to start. If you are at a racecourse then you will find a list of the best jockeys and trainers for that course in the race card, or if you are at home then you can find this in a newspaper or online. By sticking with top jockeys and trainers, you know you will have some good people on your side, who have regular winners at the track you are betting at. One last place to look at is whether a horse has won at the course before. There are many different types of racecourse in the UK, and each one of them offers a very different challenge to horses. By backing a horse that has won at the course before, you know that they are going to handle the test they have in front of them. In your paper or race card, look for a ‘C’ at the side of your horse’s name and this indicates that they are a previous course winner. This is not something you should solely rely on when you are placing your bets, but it is a good way to narrow down the field when you are looking at a race. When placing a bet on horse racing, you have to decide whether you want to back your horse to win or each way. A win bet, as it says, is a bet on a horse to win the race and for you to get a return from the bet your horse must win. An each way bet costs you twice as much because, in theory, you are placing two bets on the horse. The first is for the horse to win, and the second is for the horse to place, which is usually coming in the first three but can be the first two or first four in big fields. After deciding how you want to bet, you then need to decide on your type of bet. You can back a horse as a single to win or each way, and this is the most common way to bet on horse racing. This means you are placing one bet on one horse, and if that wins they you get a return. You can place multiple bets on horses, with a huge range of options. These can be straight multiple bets like doubles, trebles and accumulators or they can be bets that are named and include many different multiples like Trixie’s, Yankees and lucky 15’s. Newcomers are better off sticking to the basics and placing single bets, to begin with, but once you are up to speed with singles, look into other bets that you can place if you want to place multiples. The best thing you can take from this beginners guide to horse race betting is that betting on horses can be as easy, or as complicated as you want it to be. If you want to back one horse to win you can do that, or if you want to go details and place an each way Yankee on four different horses you can also do this. Take your time to learn how betting works, and slowly work your way up to more complicated bets if that is what you wish to do. The Cheltenham Festival takes place in March every year and it is the premier jump racing meeting in the UK. Here the very best horses all arrive at Cheltenham to take each other on in a series of hugely important races and to win at the festival you have to have a very good horse. Racing lasts for four days, from Tuesday to Friday and the big race of the week is Friday’s Gold Cup. This is a staying race for chasers, and the winner of the Gold Cup is always considered to be one of the best horses in training. Aintree hosts the Grand National, one of the most famous races in the world, and certainly the biggest betting race in the UK. Millions of people tune in to watch the race live every April, and they all place bets on who they think will win the biggest race of the year. The Grand National is a huge spectacle, and has huge interest on it, with even those who don’t normally bet on horse racing having a bet on this race. 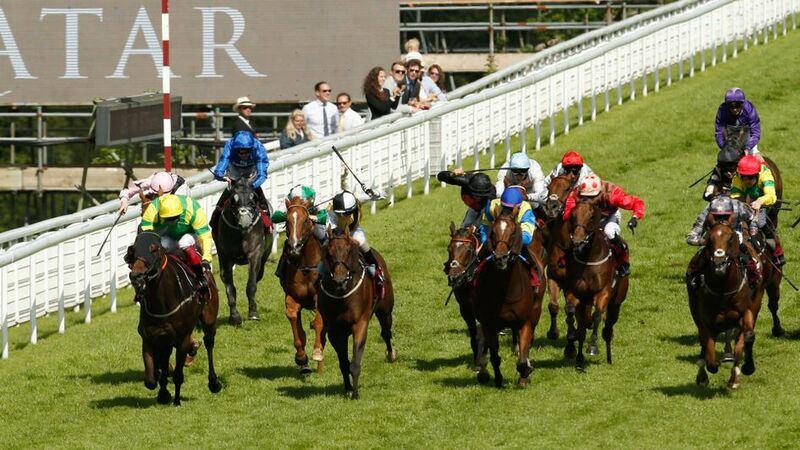 Royal Ascot is a five-day meeting in the middle of the UK flat season, taking place in June. It is a huge meeting that brings together the very best flat horses in the world to compete as well as bringing luxury and a brilliant atmosphere to the racecourse. As you can guess by the name, Royal Ascot is attended by the royal family of the UK, making this an event with huge interest. There is a lot happening on the race track, but just a much happens away from the course in this traditional, British celebration. Flat racing celebrates the best three-year-olds in training by hosting five races known as the classics of British racing. These five races are run over different distances, and for different sexes, crowing the best horse at each distance as the season develops. The first two races are in May at Newmarket, over a distance of one mile, and these are known as the 1000 and 2000 Guineas. The races are for male and female horses separately, so we can crown the best male miler and the best female miler. The next two races are the Oaks and Derby, and both of these are run over one and a half miles. These races take place at Epsom in June, with the girls battling it out for the Oaks, and the boys running in the Derby. The winners of these races are traditionally known as the best middle-distance three-year-olds after winning these races. It is not uncommon for horses to run in the Guineas and then run in either the Derby or Oaks as they progress and need to run over further, so horses can do the double in these races. The final flat classic of the season is the St Leger, a race ran at Doncaster over one and three-quarter miles, testing stamina of the three-year-olds. The race takes place in September and crowns the best young stayer in the UK. Often horses will run in this race after running in the Oaks or Derby, and the St Leger is the one classic that doesn’t get split into two for different sexes.